Cardiac myxoma is a benign tumor, but it is known for its space-occupying effect at the site of origin and frequent systemic embolization. 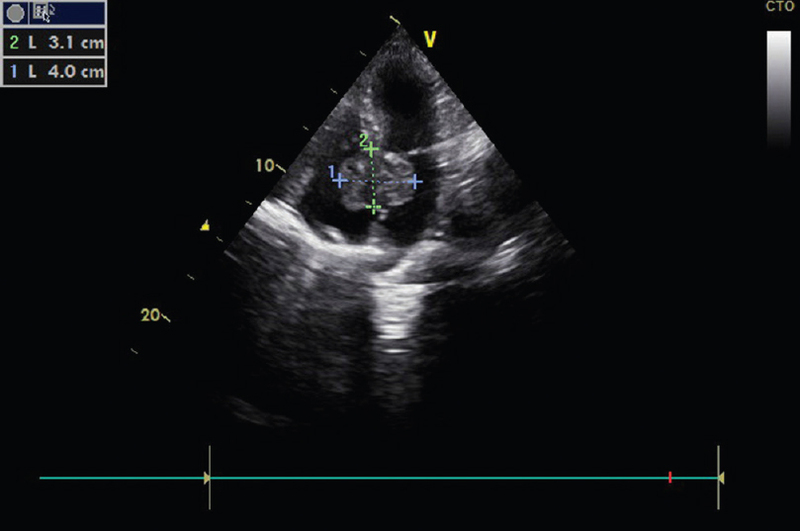 This case report highlights a biatrial myxoma of interatrial septum who presented with significant tricuspid valve regurgitation, atrial fibrillation, and cardioembolic stroke of the left parietal lobe, i.e., a biatrial myxoma with triple ripples. Cardiac myxoma is found most commonly in adult females. The median age at presentation is about 49 years, with wide range in the age of presentation from below the age of 20 years to >90 years. Left atrium is the most common site. About 90% of myxomas are solitary. Biatrial myxoma is rare. Clinical suspicion is difficult because of nonspecific clinical features such as fever, myalgia, abnormal heart sounds, murmurs, and cardioembolic stroke. Echocardiography is reputed for its high sensitive of detection of cardiac myxomas. A 69-year-old female had a massive cardioembolic stroke in the left parietal lobe 2 months earlier. There was a significant improvement of classical right-sided hemiplegia by the time of presentation to us. She was taking acenocoumarol 2 mg once daily, oral glycerin 30 ml three times daily., phenytoin 100 mg t. i. d., and small dose of loop diuretic. A 12-lead electrocardiogram showed atrial fibrillation. Transthoracic echocardiogram and transesophageal echocardiogram unanimously disclosed a classical butterfly wing (so-called dumbbell shaped) intracardiac myxoma with moderate tricuspid valve regurgitation due to direct impingement on tricuspid valve [Figure 1] and [Video 1]. There was no satellite focus. Routine workup showed normal leukocyte count, hematocrit, erythrocyte sedimentation rate, coagulation profile, kidney function test, thyroid function test, normal blood glucose level, and normal chest X-ray. A recent 16-slice computed tomography (CT) scan with contrast enhancement showed large left parietal lobe of cerebral contrast-enhancing space-occupying lesion with midline shift. She was successfully operated for myxoma. The gross pathology of resected bilobed tumor had size of 4 cm × 2 cm with smooth and jelly-like surface with foci of hemorrhage and calcification [Figure 2]. Histopathology using hematoxylin–eosin staining of the excised tumor revealed spindle-shaped cells in a loose myxoid stroma, consistent with the diagnosis of myxoma. A dumbbell or butterfly wing or so-called biatrial myxoma or interatrial septal myxoma with biatrial extension usually arises from the left atrial side of the fossa ovalis and prolapses into the right atrium through foramen ovale. Its incidence is <1%–5% of all the intracardiac myxomas.,, Although it is benign, it is well known for its local space-occupying effect and systemic embolization. A close differential diagnosis is biatrial thrombus crossing a patent foramen ovale, but either biatrial myxoma or straddling thrombus through foramen ovale is a rare diagnosis. Thrombus in this situation may have identifiable causes such as deep vein thrombosis, metastasis, and mitral stenosis. Thrombus is more irregular in shape. Intracardiac thrombus being more fragile usually presents with evidence of pulmonary, systemic embolism, and coronary embolism. It should be removed by wide base resection as soon as possible because of higher frequency of embolization. Echocardiography gives significant number of clues such as the polypoid or smooth surface myxoma, the site of origin, satellite focus, and diastolic blockage of mitral or tricuspid inflow which almost support provisional diagnosis of cardiac myxoma. Contrast-enhanced CT scan of chest or lung scintigraphy would have provided the evidence of silent concomitant pulmonary embolism but has not been done in our case neither before surgery nor after surgery because there was no evidence of pulmonary arterial hypertension and financial limitation. Impingement of tricuspid valve causing tricuspid valve regurgitation, atrial fibrillation, and cardioembolic stroke was triple ripples of dumbbell-shaped cardiac myxoma. González-Ferrer JJ, Carnero M, Labayru VL, de Isla LP, Zamorano JL. Left atrial myxoma prolapsing through the foramen ovale. Eur J Echocardiogr 2008;9:595-7. Samanidis G, Perreas K, Kalogris P, Dimitriou S, Balanika M, Amanatidis G, et al. 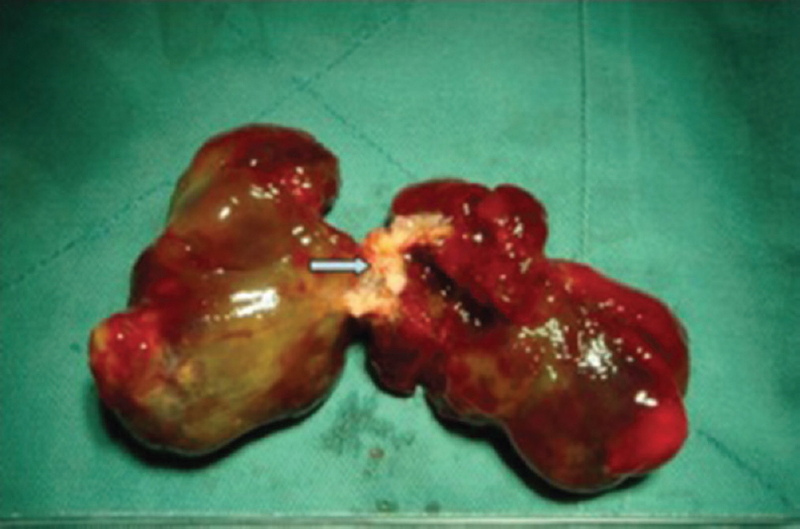 Surgical treatment of primary intracardiac myxoma: 19 years of experience. Interact Cardiovasc Thorac Surg 2011;13:597-600. Kuroczyński W, Peivandi AA, Ewald P, Pruefer D, Heinemann M, Vahl CF, et al. Cardiac myxomas: Short- and long-term follow-up. Cardiol J 2009;16:447-54. Liu D, Dong R. Clinical manifestation and surgical treatment analysis of five cases with biatrial myxoma. Int J Cardiol 2017;228:309-12. Sattar A, Win TT, Schevchuck A, Achrekar A. Extensive biatrial thrombus straddling the patent foramen ovale and traversing into the left and right ventricle. BMJ Case Rep 2016;2016:pii: bcr2016216761. Lu HT, Nordin R, Othman N, Choy CN, Kam JY, Leo BC, et al. Biatrial thrombi resembling myxoma regressed after prolonged anticoagulation in a patient with mitral stenosis: A case report. J Med Case Rep 2016;10:221. Myers PO, Fassa AA, Panos A, Licker M, Bounameaux H, Zender HO, et al. Life-threatening pulmonary embolism associated with a thrombus straddling a patent foramen ovale: Report of a case. J Card Surg 2008;23:376-8. Barik R. Letter by Barik regarding article, “Now you see it, now you don't?” Circulation 2016;133:e20. Díaz R, Aránguiz E. Asymptomatic left ventricular myxoma incidentally diagnosed by echocardiography. Report of one case. Rev Med Chil 2013;141:1594-7.